I was lucky to spend a half hour last Thursday talking to Ellen Thurston and Tom DePietro during their afternoon program on WGXC. I took an intermission from my usual monthly appearance, when I feature a single item of food , "How to Build a Pantry, One Ingredient at a Time" - and instead talked about the delicious confluence of two joyous holidays; Thanksgiving, and the first day of Chanukah. This happy collision in time will not occur again for thousands of years. Thanksgiving is always on the 4th Thursday of November, and because the Hebrew calendar is two weeks shorter than the one we use, the Gregorian calendar, you can only imagine the numerical combinations that need to click into place in order for us to celebrate a feast to give thanks for our country, and one to give thanks for oil that lit the temple lamp, on the same day, again. During my radio chat I spoke about many recipes that are holiday-interchangeable and mentioned that I would post some of them on this blog. Pancakes are latkes - Latkes are pancakes. Latkes are the emblematic Chanukah food. Chanukah, the festival of Lights is the celebration of oil (!!!) that seemed only to be enough to light the temple for one day after it was destroyed by invading Syrians more than 2,000 years ago - but, instead, it lasted for 8 days. As a reminder of the miracle, part of Chanukah celebrations include food that have been cooked in oil. No food is more popular than potato latkes. Crisp and savory - they accompany other dishes perfectly. Latkes are classically made with starchy white potatoes. Their starch helps to hold the pancakes together. I experimented for a bit to come up with a recipe that would hold non-starchy sweet potatoes together. It's important that the pancakes are flattened so that they can cook all the way through. Make them a bit larger if you like. A platter piled high with these crunchy, sweet, salty and herbaceous latkes will be just the right addition to your holiday table. 1. In a large bowl, combine the sweet potatoes, onion, sage, eggs, flour, salt, and cayenne. Stir with a wooden spoon to thoroughly blend. 2. In a medium skillet over medium-high heat, melt the butter with the corn oil. When the butter starts to brown, begin to cook the pancakes: Put a scant 1/4 cup of the mixture into the palm of your hand and flatten, forming a small 2-inch disk. Fry up to 5 pancakes at a time in the skillet. (The butter adds a nice flavor to the pancakes, but will also create foam. Five pancakes will all you'll be able to see at a time.) Use a butter spreader (which acts as mini spatula) to flip the little pancakes and fry for about 1 1/2 minutes on each side, or until brown and crisp. Remove to a paper towel-lined baking sheet to drain. Keep warm on a serving platter in a 200 degrees F. oven until all the mixture is cooked. Serve hot with sour cream and cranberry sauce, or applesauce. I developed this recipe for Bon Appetit magazine over 10 years ago. The popularity of pomegranate products has considerably increased since this recipe was published. It seems downright timely. 1. Combine the water, celery, carrot, onion, parsley, and reserved neck, heart and gizzard in a saucepan. Simmer over medium heat. Simmer until giblet broth is reduced to 3 3/4 cups, about 1 hour. Strain; discard solids. 2. Position rack in bottom third of oven and heat to 400 degrees F. Rinse turkey inside and out and pat dry. Whisk orange juice, pomegranate molasses, salt and red pepper flakes in a small bowl to blend for glaze. Place turkey on rack in a heavy large roasting pan. Starting at neck end, carefully slide hand between skin and breasts, thighs, and legs to loosen skin. Using a pastry brush or hand, apply a thin coat of pomegranate glaze over meat under skin. Stuff main cavity with lemon, quartered onion, and mint. Tuck wing tips under; tie legs together loosely. Brush turkey with some of remaining glaze. 3. Roast turkey 20 minutes. Pour 1 cup giblet broth into the pan; brush turkey with glaze. Roast 20 minutes; brush with glaze. Roast 20 minutes. Add 1 cup broth to pan, brush with glaze, and cover turkey loosely with foil. Roast 20 minutes. Brush with glaze and reduce oven temperature to 325 degrees F. Continue to roast until a thermometer inserted into the thickest part of thigh registers 175 degrees F., brushing with glaze every 20 minutes, about 1 hour 10 minutes longer, about 2 1/2 hours total. 4. Transfer turkey to a platter. Tent loosely with foil. Let stand 30 minutes (internal temperature will increase 5 to 10 degrees). Meanwhile, tilt roasting pan and spoon fat from surface of juices. Add 1 cup giblet broth to pan. Place pan over 2 burners. Bring to a simmer over medium-high heat, scraping up browned bits. Add chilled butter and simmer until gravy is smooth, whisking. Season with salt and pepper. serve turkey with gravy. This recipe comes from one of my favorite cookbooks, "Classic Italian Jewish Cooking" (Ecco, 2005). Author, Edda Servi Machlin says, "Riso coll'uvetta is an ancient Venetian dish prepared mainly during Chanukah. It has an interesting taste, but is not for every palate." I like it very ,and I like how it contrasts with savory dishes. Heat the oil in a large skillet. Add the garlic, parsley, and rice. Cook over high heat, stirring with a wooden spoon, until the garlic begins to discolor. Add the raisins and salt. Add the hot broth or water, 1/4 cup at a time, and continue to cook, uncovered , over high heat until the rice is done, about 15 minutes in all. Taste for salt and pepper and add if necessary. Serve hot or at room temperature. Just waiting to be made into tasty treats. The tomatoes were picked green about a month ago. I think I'll try them out soon. Maybe on toast with sliced avocadoes? My lunch inspired by your article... Just before the idea to sprinkle chopped pistachios over the tomatoes. 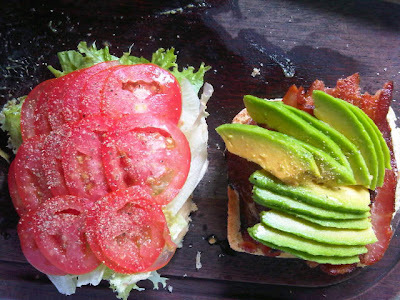 A basic BLT but with the addition of some home grown avocado, a smear of fresh pea puree on 1 side of toasted home made bread. Obviously the other toasted slice had a wisp of Hellmann's. It was delicious! - Mr. Guy, The Peninsula House, Las Terrenas, D.R. Not just sandwiches on my mind - although they do make eating a meal a convenient exercise - but also cocktails. I refer to the time spent with the friends mentioned in my article. I was happy to be their guest at the same time that their daughter, and grandchildren were also in residence. Somewhere around 5:30 - 6 pm when there's a universal desire for an apertivo - a little preprandial cocktail, something to stimulate the appetite(should you need to be coaxed - or not). I tried to explain the concept of happy hour to the kids, ages 5 - 10 - and talked about the Shirley Temples of my childhood and started to remember the ingredients for the cheerful, non-alcoholic cocktail named for an equally cheerful child movie star (MUCH older than I). Grenadine is the addition that gave the drink its color and faint flavor. Grenadine is made with pomegranates I said. And that's when Rita, my host, said that she had some pomegranate molasses. Then Tessa, the 8-year old, middle grandchild, and I created an eponymous cocktail for the minors in the group to enjoy. Tessa thought that adding edible pea blossoms to the straw would identify the cocktail. She was right. Her comment after her sip - "It tastes a little like Gummy Bears." High praise, don't you think? Add the pomegranate molasses to a highball glass. Add the orange juice, ice and mint. Pour in the sparkling water to fill the glass. Stick a sweet pea blossom into one end of a straw. Use the straw as a mixer, and stir/muddle all the ingredients together. Sip. Chicken-of-the-woods mushrooms which were harvested right after this photo was snapped - grilled with garlic and olive oil, garnished with freshly chopped garlic - eaten with dinner. SUSANSIMONSAYS: another thing to do with what will soon become a surfeit of vine ripened tomatoes (isn't that the way it goes - you wait and wait for them and all of a sudden there are mounds and mounds of them and not enough time to make everything you desire?). I call this Pan Valenciano because that's what I understood it to be called when I ate it in Barcelona years ago. I think that it's also called Pan Tomate. It's simple: Cut a baguette in half, lengthwise (or any bread); cut a very ripe tomato in half and squeeze and smear it on the bread; drizzle extra-virgin olive oil all over the bread and sprinkle with coarse sea salt. Bake at 350 degrees F. until the bread is golden and appears crispy. Eat with just about anything. 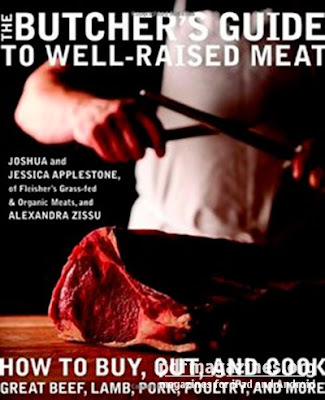 Come, meet Joshua and Jessica Applestone the owners of the renowned Fleisher's Meats in Kingston, and Brooklyn, New York, who'll be at the Hudson Farmers' Market on the 27th July from 10am - noon signing copies of their book - "The Butcher's Guide to Well-Raised Meat". The book is a must, not just for carnivores but also for those who have eliminated meat from their diets and are reconsidering their choices. Josh, a former vegan, and Jess, a vegetarian - will tell you in their own words about their conversion back to meat, and how they think about raising and treating the animals who'll become dinner. The Hudson Farmers' Market is located at 6th and Columbia Streets in downtown Hudson. Susan Simon Says - Food for Thought column in tomorrow's paper - www.registerstar.com (click on columnists and scroll down to mine) has five, almost no-cook salad recipes to make when you don't want to rely on your stove - too much. Not with this summer's weather. My friend, Mary, who was my neighbor when I lived in the East Village (NYC) - still lives there, but also has a home near where I live now. Her fully organic, biodynamic vegetable garden ripened rapidly with the recent heat wave. Everything matured at once. She sent me an email at the beginning of the week inviting me to go over to her property and help myself to vegetables. The picture shows what I harvested without making a dent in what was available . Those poor little tomatoes, just bursting out of their skins will make a wonderful raw pasta sauce or relish. I'll be keeping track of what I make and share the dishes with you. Of course, Allegra came along and even went for a dip in the pond. The blue hydrangeas that are to be found in everyone's garden, everywhere on the island, achieve their startling blue color from Nantucket's lime-rich soil. A Pimm's cup made by a native Englishman. Although, "Sorry, I didn't have real English lemonade", said David Lovett who put together the beautiful, refreshing, and legendary summertime drink. Mix 1 part Pimm's No. 1 with 3 parts chilled lemonade - the English lemonade is carbonated, so David added sparkling water to flat lemonade (I'd use San Pellegrino limonata). Garnish with cucumbers, strawberries, orange, and mint leaves. Fresh oysters from the Steve Bender's Pocomo Meadows oyster farm. All that the mollusks, floating in a saline puddle, needed was a touch of lemon to complement the sweetness that you tasted once you bit into them. Eggs gathered a few hours after they were laid, poached, and garnished with wild rose sea salt from Ambrosia. The views that never cease to soothe me. The variety of fresh fish at the market - or gifted from a fisherman pal. Perhaps the most repeated island preparation for bluefish, the ubiquitous summertime catch, this recipe does a good job of disguising and at the same time complementing the infamous bluefish flavor. Here's a hint: Take a good look at the fillets. If there appears to be a lot of dark meat on the underside of the fish, cut it away. That's the strong-tasting part of the fish. 1. Heat an oven to 400 degrees F. Wash and pat dry the fillets. Butter a baking dish and place the fillets in it. rub them with the salt and pepper. In a bowl, combine the sour cream, mayonnaise, chive and lemon juice. Cover the fish with this mixture. 2. Bake for 20 minutes, or until the fish is firm and opaque all the way through. the set under a broiler for 5 minutes to brown. Serve piping hot. A dog, Allegra, who still loves the beach. SUSANSIMONSAYS: Even although I'm posting less frequently than I have in the past, I write a regular food column for the Hudson-Catskill papers that's published every Friday in several upstate New York county papers. You can find the column, Susan Simon Says - Food for Thought by going to www.registerstar.com , clicking on columnists and scrolling down 'til you find my column. It would be nice if you would consider bookmarking it for weekly updates. Thanks. Jessica and Joshua Applestone who were scheduled to appear at the Hudson Farmers' Market this weekend, July 13th, to sign copies of their book, "A Butcher's Guide to Well-Raised Meat" (Fleisher' Meat market) have had to postpone until July 27th. OK - what's Lisa Dolan is telling Chris Jones that's so funny? It's unlike me to blog so quickly on the heels of a post ( especially since I've been a bit sloth-like for the past few months) - but after a day like this one I feel that I need to get the word out right away. Aside from the fact that today's weather was the kind that you want to bottle for use on a particularly dreary day in February - this day, for me, began at the Hudson Farmers' Market where we hosted our first cookbook author of the year under the market's Book Tent. 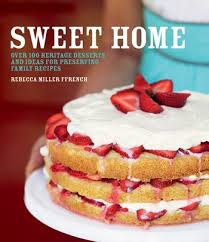 Rebecca Miller Ffrench signed her new book, Sweet Home (Kyle Books, 2012), for shoppers, and graciously offered samples made from recipes in her book. It would be difficult for me to say which tasted more delicious; Kahlua Chocolate Pound Cake - buttery, chocolaty with slight bittersweet coffee flavor, Brown Sugar Glazed Cardamom Cake - maybe my favorite, only because I love cardamom flavored anything (Rebecca gave me the leftover samples which I brought home and immediately soaked in homemade kefir and topped with strawberry - rhubarb compote, Smiles from a Summer Night ), and her book-cover-photo recipe, Mile-High Strawberry Shortcake. Which she only made a third of a mile high for anxious-to-taste shoppers. When she ran out of the strawberries that she brought with her - she dashed right over to the Samascott Orchards' tent and bought some more. Rebecca says, "Layers of buttery shortcake, juicy berries, and thick cream piled sky high are the epitome of a summer dessert, and the perfect finish to a family barbecue or Fourth of July picnic." You listening? 1. Make the shortcakes: Preheat oven to 425 degrees F. Grease three 8-inch round cake pans with baking spray. 2. Stir together the flour, baking powder, sugar, and salt in a bowl. Sprinkle the butter pieces into the bowl. Using a pastry blender or two forks, work the butter into the dry ingredients until it's coarse and crumbly. Slowly add the cream, little by little, until a soft dough forms. Do not over stir. 3. Using your hands, form a large ball with the dough and then divide into three parts. Press each section firmly and evenly into one of the prepared pans. Bake for 12 to 15 minutes, or until the tops become a very pale golden. 4. Meanwhile, make the filling: Put the strawberries in a bowl and toss with the granulated sugar and lemon juice. Remove half of the strawberries and lightly mash the remaining. Stir the whole strawberries back in and let stand for 30 minutes. 5. Remove the cakes from the oven. Let cool for 15 minutes before carefully removing them from the pans. 6. Meanwhile, in the bowl of an electric mixer fitted with the whisk attachment, whip the cream until thickened, but still soft. Stir in the confectioners' sugar and vanilla extract with a spoon. 7. Brush 1 tablespoon of the melted butter on top of each cake with a pastry brush. Place one layer on a serving plate, butter side up. Spoon a third of the berries with their juice on top. Spread a thin layer of whipped cream over the berries. Top with a second cake layer. Spoon half of the remaining berries on top and another thin layer of cream. Repeat with the remaining cake layer and berries, reserving a few berries to decorate the top. 8. Dollop the remaining whipped cream on top of the cake and decorate with a few good-looking berries. Serve in wedges. Today is Pride Day in Hudson - not just gay pride - everybody pride. The day, called "Over The Rainbow" has included many celebrations. I stood on Warren Street and watched the parade. A good old-fashioned parade it was, with organizations from church groups to the Antique Dealers Association, dogs, from the ladies dressed in vintage, colors-from-the-rainbow dresses (Five and Diamond) to bagpipers, dogs, marching bands, the mayor, and the president of the Common Council, the radio stations, dogs, and I can't remember - but they were all fabulous. Dogs. The parade, which started near the top of Warren Street, ended at the park on the river which was set up to receive the spectators with refreshment stands, information booths and rides for the kids. And it's not over. There are parties, and barbecues and a big dance party tonight at Club Helsinki. I think that I'm done. I need my legs to work tomorrow. It was a grand day in Hudson. SUSANSIMONSAYS: If I don't get to it - and I may not by next Saturday. Please come to meet Raymond Sokolov who will be signing his new book, STEAL THE MENU at the Hudson Farmers' Market on Saturday, June 22nd. 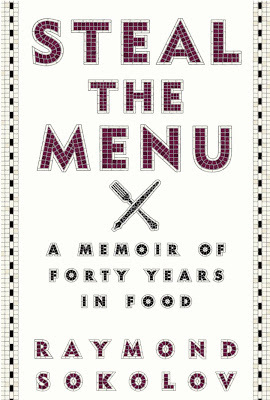 The book is a memoir of forty years in food that included taking Craig Claiborne's job as food editor of The New York Times, more recently the Eating Out column for The Wall Street Journal, and writing cook books like the invaluable SAUCIER'S APPRENTICE, and THE COOK'S CANON: 101 CLASSIC RECIPES EVERYONE SHOULD KNOW. 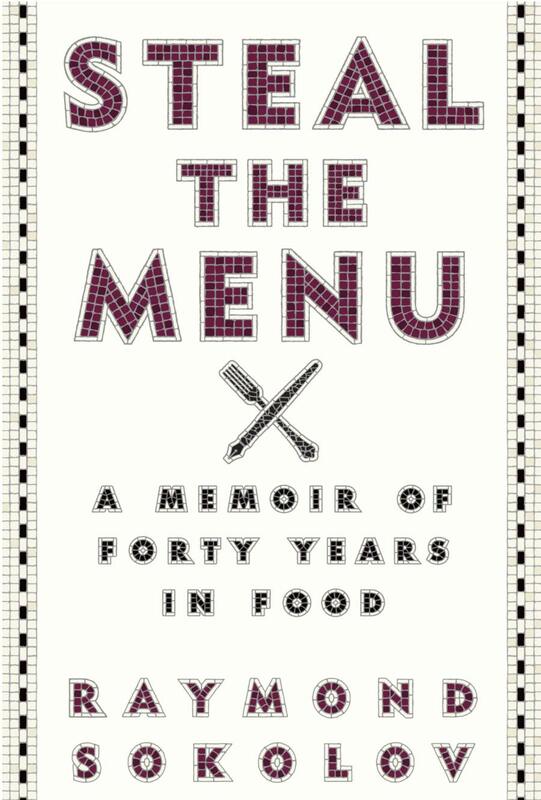 His appearance at the markets' Book Tent offers a wonderful opportunity to meet one of the legends of food writing - and have him sign a copy of his latest book for you. If you didn't get to the Farmers' Market today and would like to have signed copy of SWEET HOME - there are a few available for sale at MarxHome on Warren Street in Hudson.